We had an interesting discussion about the criteria for the Newbery Award and the popularity of Newbery-winning books. One of my staff members recently had a patron who was specifically looking for award-winning books for his child, but didn't want "dark" subjects. We talked about how we might handle this, suggesting particular titles that would fit his criteria and suggesting that he also look at the honor-winners, since that gives you a very large pool to choose from. 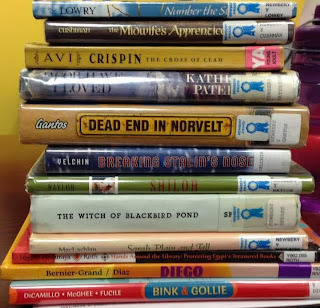 We also talked about the importance of the Newbery Award to recognize truly distinguished literature, even if the books may not be the most popular. This month, after our booktalks, we had a conversation about readers' advisory in general and the readers' advisory interview in particular. One of the BINGO squares for our new Winter Reading Club is "A Librarian's Suggestion", so we talked about how we might proceed when we have children asking us for a suggestion. I confessed that my mind usually goes blank at first and it helps me to have a strategy of how to start the conversation. We talked about questions we could ask to find out what kind of books the patron enjoys. Kids (or patrons of any age) may not be able to answer the question, "What kind of books are you looking for? ", but if you start with "What was the last book you really loved?" and "What did you love about it? ", you may get some concrete answers. If a child can't think of any books he or she has enjoyed, ask about movies, TV, or hobbies. Even if you're not familiar with a particular title or show, if a kid can tell you what they like about it, it gives you a starting place. Maybe she loved the adventure in 39 Clues. Maybe he loved the spunky main character in Three Times Lucky. Maybe she loved learning about real events in the I Survived... books. Use whatever you can to get that conversation started and encourage the child to check out a selection of books in case they start one and don't like it. Although we're participating in this program to read widely and improve our readers' advisory skills, using tools like Novelist, Goodreads, and Amazon is not cheating! We also keep lists of our past Reading Wildly lists that may help job our memory as we start these transactions. January's books will be Reader's Choice since I know how busy things get around the holidays. To facilitate our discussion about reader's advisory, I passed out this basic guide to reader's advisory from the Ohio Library Council, which we'll discuss at our next meeting. And stay tuned because tomorrow I'll be talking about our Reading Wildly plans for 2014!